Middleton Life is an exciting project involving South Leeds Life which has seen a group of Middleton residents become local history reporters and investigate the past of their community. 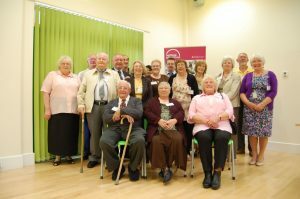 The hard work of members of the Middleton Life project was celebrated at a special event at Tenants Hall Enterprise Centre in summer 2012 when exhibition panels they helped put together were unveiled, alongside the premiere of a 20-minute film about Middleton’s history. 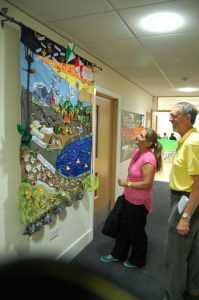 Local residents are cordially invited to pop into Tenants Hall Enterprise Centre to see the exhibition, which consists of panels, a special stained glass window, wall hanging and old photos. Led by volunteers from the local community, Middleton Life received £49,600 from the Heritage Lottery Fund (HLF). The project, run by Health For All, aimed to empower residents to tell the history of the area and people’s life stories. Not only have they put together panels celebrating Middleton’s history at the new £1.6 million Tenants Hall, they’ve interviewed their fellow residents about their memories and captured them for a special film, which we’ve split into six sections. You can watch all six parts on our special Youtube Channel. 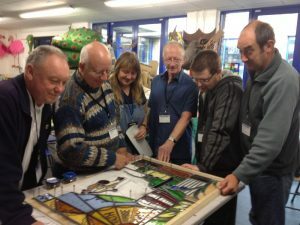 With support from Cockburn School, some members researched and put together a small stained glass window, and pupils at nearby Middleton Primary School designed a special Middleton wall hanging. Both are displayed at Tenants Hall. As part of the background research for the project, members enjoyed trips to Middleton Woods with The Friends of Middleton Park and Middleton Railway to explore the area’s rich mining and industrial heritage. They also visited Thackray Museum and the National Coalmining Museum. In early 2013 the group successfully applied for funding through Community First to continue the group. It reformed in February and now meets monthly on the first Wednesday of each month at Tenants Hall Enterprise Centre, Acre Close, Middleton (1oam-noon). The group – which now has its own committee made of local residents – invites guest speakers on local history and is looking to put together a new publication on Middleton’s history. For further information contact John Baron at Health For All on 0113 270 6903 or email john.baron@healthforall.org.uk. You can find a feed of all Middleton Life posts on South Leeds Life here. I’ve just come back home (Newcastle) from Middleton today after visiting my Mother’s grave at St Mary’s church. It’s such a shame I didn’t know about this going on as I have some interesting stuff, mainly to do with The Crossland family I could have contributed.